The Three Gorges Dam is a hydroelectric gravity dam that spans the Yangtze River by the town of Sandouping, in Yiling District, Yichang, Hubei province, China. The Three Gorges Dam has been the world's largest power station in terms of installed capacity (22,500 MW) since 2012. In 2014, the dam generated 98.8 terawatt-hours (TWh) and had the world record, but was surpassed by the Itaipú Dam, which set the new world record in 2016, producing 103.1 TWh. A large dam across the Yangtze River was originally envisioned by Sun Yat-sen in The International Development of China, in 1919. He stated that a dam capable of generating 30 million horsepower (22 GW) was possible downstream of the Three Gorges. In 1932, the Nationalist government, led by Chiang Kai-shek, began preliminary work on plans in the Three Gorges. In 1939, Japanese military forces occupied Yichang and surveyed the area. A design, the Otani plan, was completed for the dam in anticipation of a Japanese victory over China. In 1944, the United States Bureau of Reclamation head design engineer, John L. Savage, surveyed the area and drew up a dam proposal for the 'Yangtze River Project'. Some 54 Chinese engineers went to the U.S. for training. The original plans called for the dam to employ a unique method for moving ships; the ships would move into locks located at the lower and upper ends of the dam and then cranes with cables would move the ships from one lock to the next. In the case of smaller water craft, groups of craft would be lifted together for efficiency. It is not known whether this solution was considered for its water-saving performance or because the engineers thought the difference in height between the river above and below the dam too great for alternative methods. 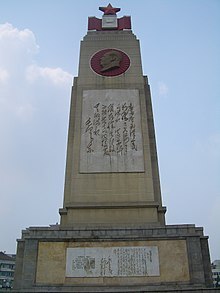 Some exploration, survey, economic study, and design work was done, but the government, in the midst of the Chinese Civil War, halted work in 1947. After the 1949 Communist takeover, Mao Zedong supported the project, but began the Gezhouba Dam project nearby first, and economic problems including the Great Leap Forward and the Cultural Revolution slowed progress. After the 1954 Yangtze River Floods, in 1956, Mao Zedong authored "Swimming", a poem about his fascination with a dam on the Yangtze River. In 1958, after the Hundred Flowers Campaign, some engineers who spoke out against the project were imprisoned. During the 1980s, the idea of a dam reemerged. The National People's Congress approved the dam in 1992: out of 2,633 delegates, 1,767 voted in favour, 177 voted against, 664 abstained, and 25 members did not vote. Construction started on December 14, 1994. The dam was expected to be fully operational in 2009, but additional projects, such as the underground power plant with six additional generators, delayed full operation until May 2012. [verification needed] The ship lift was completed in 2015. The dam had raised the water level in the reservoir to 172.5 m (566 ft) above sea level by the end of 2008 and the designed maximum level of 175 m (574 ft) by October 2010. Earthfill south dam in foreground with view along main dam. The wall beyond is to separate spillway and turbine flows from the lock and ship lift upstream approach channel. A similar separation is used on the downstream side, seen partially in the preceding image. Made of concrete and steel, the dam is 2,335 m (7,661 ft) long and the top of the dam is 185 m (607 ft) above sea level. The project used 27.2×10^6 m3 (35.6×10^6 cu yd) of concrete (mainly for the dam wall), used 463,000 T of steel (enough to build 63 Eiffel Towers), and moved about 102.6×10^6 m3 (134.2×10^6 cu yd) of earth. The concrete dam wall is 181 m (594 ft) high above the rock basis. When the water level is at its maximum of 175 m (574 ft) above sea level, 110 m (361 ft) higher than the river level downstream, the dam reservoir is on average about 660 km (410 mi) in length and 1.12 km (3,675 ft) in width. It contains 39.3 km3 (31,900,000 acre⋅ft) of water and has a total surface area of 1,045 km2 (403 sq mi). On completion, the reservoir flooded a total area of 632 km2 (244 sq mi) of land, compared to the 1,350 km2 (520 sq mi) of reservoir created by the Itaipu Dam. The government estimated that the Three Gorges Dam project would cost 180 billion yuan (US$22.5 billion). By the end of 2008, spending had reached 148.365 billion yuan, among which 64.613 billion yuan was spent on construction, 68.557 billion yuan on relocating affected residents, and 15.195 billion yuan on financing. It was estimated in 2009 that the construction cost would be recovered when the dam had generated 1,000 terawatt-hours (3,600 PJ) of electricity, yielding 250 billion yuan. Full cost recovery was thus expected to occur ten years after the dam started full operation, but the full cost of the Three Gorges Dam was recovered by December 20, 2013. Funding sources include the Three Gorges Dam Construction Fund, profits from the Gezhouba Dam, loans from the China Development Bank, loans from domestic and foreign commercial banks, corporate bonds, and revenue from both before and after the dam is fully operational. Additional charges were assessed as follows: Every province receiving power from the Three Gorges Dam had to pay ¥7.00 per MWh extra. Other provinces had to pay an additional charge of ¥4.00 per MWh. The Tibet Autonomous Region pays no surcharge. Electricity production in China by source. Compare: The fully completed Three Gorges dam will contribute about 100 TWh of generation per year. Power generation is managed by China Yangtze Power, a listed subsidiary of China Three Gorges Corporation (CTGC)—a Central Enterprise SOE administered by SASAC. The Three Gorges Dam is the world's largest capacity hydroelectric power station with 34 generators: 32 main generators, each with a capacity of 700 MW, and two plant power generators, each with capacity of 50 MW, making a total capacity of 22,500 MW. Among those 32 main generators, 14 are installed in the north side of the dam, 12 in the south side, and the remaining six in the underground power plant in the mountain south of the dam. Annual electricity generation in 2015 was 87 TWh, which is 20 times more than the Hoover Dam. The main generators weigh about 6,000 tonnes each and are designed to produce more than 700 MW of power. The designed head of the generator is 80.6 meters (264 ft). The flow rate varies between 600–950 cubic metres per second (21,000–34,000 cu ft/s) depending on the head available. The greater the head, the less water needed to reach full power. Three Gorges uses Francis turbines. Turbine diameter is 9.7/10.4 m (VGS design/Alstom's design) and rotation speed is 75 revolutions per minute. This means that in order to generate power at 50 Hz, the generator rotors have 80 poles. Rated power is 778 MVA, with a maximum of 840 MVA and a power factor of 0.9. The generator produces electrical power at 20 kV. The electricity generated is then stepped-up to 500 kV for transmission at 50 Hz. The outer diameter of the generator stator is 21.4/20.9 m. The inner diameter is 18.5/18.8 m. The stator, the biggest of its kind, is 3.1/3 m in height. Bearing load is 5050/5500 tonnes. Average efficiency is over 94%, and reaches 96.5%. The generators were manufactured by two joint ventures: one of them Alstom, ABB Group, Kvaerner, and the Chinese company Harbin Motor; the other Voith, General Electric, Siemens (abbreviated as VGS), and the Chinese company Oriental Motor. The technology transfer agreement was signed together with the contract. Most of the generators are water-cooled. Some newer ones are air-cooled, which are simpler in design and manufacture and are easier to maintain. The first north side main generator (No. 2) started on July 10, 2003; the north side became completely operational September 7, 2005, with the implementation of generator No. 9. Full power (9,800 MW) was only reached on October 18, 2006, after the water level reached 156 m.
The 12 south side main generators are also in operation. No. 22 began operation on June 11, 2007, and No. 15 started up on October 30, 2008. The sixth (No. 17) began operation on December 18, 2007, raising capacity to 14.1 GW, finally surpassing Itaipu (14.0 GW), to become the world's largest hydro power plant by capacity. As of May 23, 2012, when the last main generator, No. 27, finished its final test, the six underground main generators are also in operation, raising capacity to 22.5 GW. After nine years of construction, installation and testing, the power plant is now fully operational. By August 16, 2011, the plant had generated 500 TWh of electricity. In July 2008 it generated 10.3 TWh of electricity, its first month over 10 TWh. On June 30, 2009, after the river flow rate increased to over 24,000 m3, all 28 generators were switched on, producing only 16,100 MW because the head available during flood season is insufficient. During an August 2009 flood, the plant first reached its maximum output for a short period. During the November to May dry season, power output is limited by the river's flow rate, as seen in the diagrams on the right. When there is enough flow, power output is limited by plant generating capacity. The maximum power-output curves were calculated based on the average flow rate at the dam site, assuming the water level is 175 m and the plant gross efficiency is 90.15%. The actual power output in 2008 was obtained based on the monthly electricity sent to the grid. The Three Gorges Dam reached its design-maximum reservoir water level of 175 m (574 ft) for the first time on October 26, 2010, in which the intended annual power-generation capacity of 84.7 TWh was realized. In 2012, the dam's 32 generating units generated a record 98.1 TWh of electricity, which accounts for 14% of China's total hydro generation. The State Grid Corporation and China Southern Power Grid paid a flat rate of ¥250 per MWh (US$35.7) until July 2, 2008. Since then, the price has varied by province, from ¥228.7–401.8 per MWh. Higher-paying customers, such as Shanghai, receive priority. Nine provinces and two cities consume power from the dam. Power distribution and transmission infrastructure cost about 34.387 billion Yuan. Construction was completed in December 2007, one year ahead of schedule. Power is distributed over multiple 500 kilovolt (kV) transmission lines. Three direct current (DC) lines to the East China Grid carry 7,200 MW: Three Gorges – Shanghai (3,000 MW), HVDC Three Gorges – Changzhou (3,000 MW), and HVDC Gezhouba – Shanghai (1,200 MW). The alternating current (AC) lines to the Central China Grid have a total capacity of 12,000 MW. The DC transmission line HVDC Three Gorges – Guangdong to the South China Grid has a capacity of 3,000 MW. The dam was expected to provide 10% of China's power. However, electricity demand has increased more quickly than previously projected. Even fully operational, on average, it supports only about 1.7% of electricity demand in China in the year of 2011, when the Chinese electricity demand reached 4692.8 TWh. According to the National Development and Reform Commission of China, 366 grams of coal would produce 1 kWh of electricity during 2006. At full power, Three Gorges reduces coal consumption by 31 million tonnes per year, avoiding 100 million tonnes of greenhouse gas emissions, millions of tonnes of dust, one million tonnes of sulfur dioxide, 370,000 tonnes of nitric oxide, 10,000 tonnes of carbon monoxide, and a significant amount of mercury. Hydropower saves the energy needed to mine, wash, and transport the coal from northern China. From 2003 to 2007, power production equaled that of 84 million tonnes of standard coal, reducing carbon dioxide by 190 million tonnes, sulfur dioxide by 2.29 million tonnes, and nitrogen oxides by 980,000 tonnes. The dam increased the Yangtze's barge capacity sixfold, reducing carbon dioxide emission by 630,000 tonnes. From 2004 to 2007, a total of 198 million tonnes of goods passed through the ship locks. Compared to using trucking, barges reduced carbon dioxide emission by ten million tonnes and lowered costs by 25%. Two hazards are uniquely identified with the dam. One is that sedimentation projections are not agreed upon, and the other is that the dam sits on a seismic fault. At current levels, 80% of the land in the area is experiencing erosion, depositing about 40 million tons of sediment into the Yangtze annually. Because the flow is slower above the dam, much of this sediment will now settle there instead of flowing downstream, and there will be less sediment downstream. Shanghai, more than 1,600 km (990 mi) away, rests on a massive sedimentary plain. The "arriving silt—so long as it does arrive—strengthens the bed on which Shanghai is built... the less the tonnage of arriving sediment the more vulnerable is this biggest of Chinese cities to inundation..."
Erosion in the reservoir, induced by rising water, causes frequent major landslides that have led to noticeable disturbance in the reservoir surface, including two incidents in May 2009 when somewhere between 20,000 and 50,000 cubic metres (26,000 and 65,000 cu yd) of material plunged into the flooded Wuxia Gorge of the Wu River. Also, in the first four months of 2010, there were 97 significant landslides. The dam catalyzed improved upstream wastewater treatment around Chongqing and its suburban areas. According to the Ministry of Environmental Protection, as of April 2007, more than 50 new plants could treat 1.84 million tonnes per day, 65% of the total need. About 32 landfills were added, which could handle 7,664.5 tonnes of solid waste every day. Over one billion tons of wastewater are released annually into the river, which was more likely to be swept away before the reservoir was created. This has left the water looking stagnant, polluted and murky. In 1997, the Three Gorges area had 10% forestation, down from 20% in the 1950s. Research by the United Nations Food and Agriculture Organization research suggested that the Asia-Pacific region would, overall, gain about 6,000 km2 (2,300 sq mi) of forest by 2008. That is a significant change from the 13,000 km2 (5,000 sq mi) net loss of forest each year in the 1990s. This is largely due to China's large reforestation effort. This accelerated after the 1998 Yangtze River floods convinced the government that it must restore tree cover, especially in the Yangtze's basin upstream of the Three Gorges Dam. Concerns about the potential wildlife impact of the dam predate the National People's Congress's approval in 1992. This region has long been known for its rich biodiversity. It is home to 6,388 species of plants, which belong to 238 families and 1508 genera. Of these plant species, 57 percent are endangered. These rare species are also used as ingredients in traditional Chinese medicines. Already, the percentage of forested area in the region surrounding the Three Gorges Dam has dropped from twenty percent in 1950 to less than ten percent as of 2002, negatively affecting all plant species in this locality. The region also provides habitats to hundreds of freshwater and terrestrial animal species. Freshwater fish are especially affected by dams due to changes in the water temperature and flow regime. Many other fish are hurt in the turbine blades of the hydroelectric plants as well. This is particularly detrimental to the ecosystem of the region because the Yangtze River basin is home to 361 different fish species and accounts for twenty-seven percent of all endangered freshwater fish species in China. Other aquatic species have been endangered by the dam, particularly the baiji, or Chinese river dolphin, now extinct. In fact, Government Chinese scholars even claim that the Three Gorges Dam directly caused the extinction of the baiji. Of the 3,000 to 4,000 remaining critically endangered Siberian crane, a large number currently spend the winter in wetlands that will be destroyed by the Three Gorges Dam. The dam contributed to the functional extinction of the baiji Yangtze river dolphin. Though it was close to this level even at the start of construction, the dam further decreased its habitat and increased ship travel, which are among the factors causing what will be its ultimate demise. In addition, populations of the Yangtze sturgeon are guaranteed to be "negatively affected" by the dam. 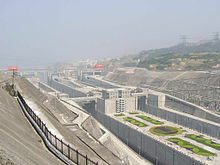 An important function of the dam is to control flooding, which is a major problem for the seasonal river of the Yangtze. Millions of people live downstream of the dam, with many large, important cities like Wuhan, Nanjing, and Shanghai situated adjacent to the river. Plenty of farm land and China's most important industrial area are built beside the river. The reservoir's flood storage capacity is 22 cubic kilometres (5.3 cu mi; 18,000,000 acre⋅ft). This capacity will reduce the frequency of major downstream flooding from once every 10 years to once every 100 years. The dam is expected to minimize the effect of even a "super" flood. In 1954, the river flooded 193,000 km2 (74,500 sq mi), killing 33,169 people and forcing 18,884,000 people to move. The flood covered Wuhan, a city of eight million people, for over three months, and the Jingguang Railway was out of service for more than 100 days. The 1954 flood carried 50 cubic kilometres (12 cu mi) of water. The dam could only divert the water above Chenglingji, leaving 30 to 40 km3 (7.2 to 9.6 cu mi) to be diverted. Also, the dam cannot protect against some of the large tributaries downstream, including the Xiang, Zishui, Yuanshui, Lishui, Hanshui, and the Gan. In 1998, a flood in the same area caused billions of dollars in damage; 2,039 km2 (787 sq mi) of farm land were flooded. The flood affected more than 2.3 million people, killing 1,526. In early August 2009, the largest flood in five years passed through the dam site. The dam limited the water flow to less than 40,000 cubic metres (1,400,000 cu ft) per second, raising the upstream water level from 145.13 m (476.1 ft) on August 1, 2009, to 152.88 m (501.6 ft) on August 8, 2009. A full 4.27 km3 (1.02 cu mi) of flood water was captured and the river flow was cut by as much as 15,000 m3 (530,000 cu ft) per second. The dam discharges its reservoir during the dry season between December and March every year. This increases the flow rate of the river downstream, and provides fresh water for agricultural and industrial usage. It also improves shipping conditions. The water level upstream drops from 175 to 145 m (574 to 476 ft), preparing for the rainy season. The water also powers the Gezhouba Dam downstream. Since the filling of the reservoir in 2003, the Three Gorges Dam has supplied an extra 11 km3 (2.6 cu mi) of fresh water to downstream cities and farms during the dry season. During the 2010 South China floods in July, inflows at the Three Gorges Dam reached a peak of 70,000 m3/s (2,500,000 cu ft/s), exceeding the peak during the 1998 Yangtze River Floods. The dam's reservoir rose nearly 3 m (9.8 ft) in 24 hours and reduced the outflow to 40,000 m3/s (1,400,000 cu ft/s) in discharges downstream, effectively alleviating serious impacts on the middle and lower river. The installation of ship locks is intended to increase river shipping from ten million to 100 million tonnes annually, as a result transportation costs will be cut between 30 and 37%. Shipping will become safer, since the gorges are notoriously dangerous to navigate. Ships with much deeper draft will be able to navigate 2,400 kilometres (1,500 mi) upstream from Shanghai all the way to Chongqing. It is expected that shipping to Chongqing will increase fivefold. There are two series of ship locks installed near the dam (30°50′12″N 111°1′10″E﻿ / ﻿30.83667°N 111.01944°E﻿ / 30.83667; 111.01944). Each of them is made up of five stages, with transit time at around four hours. Maximum vessel size is 10,000 tons. The locks are 280 m long, 35 m wide, and 5 m deep (918 × 114 × 16.4 ft). That is 30 m (98 ft) longer than those on the St Lawrence Seaway, but half as deep. Before the dam was constructed, the maximum freight capacity at the Three Gorges site was 18.0 million tonnes per year. From 2004 to 2007, a total of 198 million tonnes of freight passed through the locks. The freight capacity of the river increased six times and the cost of shipping was reduced by 25%. The total capacity of the ship locks is expected to reach 100 million tonnes per year. These locks are staircase locks, whereby inner lock gate pairs serve as both the upper gate and lower gate. The gates are the vulnerable hinged type, which, if damaged, could temporarily render the entire flight unusable. As there are separate sets of locks for upstream and downstream traffic, this system is more water efficient than bi-directional staircase locks. The shiplift, a kind of elevator, can lift vessels of up to 3,000 tonnes, at a fraction of the time to transit the staircase locks. In addition to the canal locks, there is a ship lift, a kind of elevator for vessels. The ship lift can lift ships of up to 3,000 tons. The vertical distance traveled is 113 m (371 ft), and the size of the ship lift's basin is 120 m × 18 m × 3.5 m (394 ft × 59 ft × 11 ft). The ship lift takes 30 to 40 minutes to transit, as opposed to the three to four hours for stepping through the locks. One complicating factor is that the water level can vary dramatically. The ship lift must work even if water levels vary by 12 meters (39 ft) on the lower side, and 30 m (98 ft) on the upper side. The ship lift's design uses a helical gear system, to climb or descend a toothed rack. The ship lift was not yet complete when the rest of the project was officially opened on May 20, 2006. In November 2007, it was reported in the local media that construction of the ship lift started in October 2007. In February 2012, Xinhua reported that the four towers that are to support the ship lift had almost been completed. The report said the towers had reached 189 m (620 ft) of the anticipated 195 m (640 ft), the towers would be completed by June 2012 and the entire shiplift in 2015. As of May 2014, the ship lift was expected to be completed by July 2015. It was tested in December 2015 and announced complete in January 2016. Lahmeyer, the German firm that designed the ship lift, said it will take a vessel less than an hour to transit the lift. An article in Steel Construction says the actual time of the lift will be 21 minutes. It says that the expected dimensions of the 3,000 tonnes (3,000,000 kg) passenger vessels the ship lift's basin was designed to carry will be 84.5 by 17.2 by 2.65 metres (277.2 ft × 56.4 ft × 8.7 ft). The moving mass (including counterweights) is 34,000 tonnes. The trials of elevator finished in July 2016, the first cargo ship was lifted in July 15, the lift time comprised 8 minutes.Shanghai Daily reported that the first operational use of the lift was on September 18, 2016, when limited "operational testing" of the lift began. Plans also exist for the construction of short portage railways bypassing the dam area altogether. Two short rail lines, one on each side of the river, are to be constructed. The 88-kilometre (55 mi) long northern portage railway (北岸翻坝铁路) will run from the Taipingxi port facility (太平溪港) on the northern side of the Yangtze, just upstream from the dam, via Yichang East Railway Station to the Baiyang Tianjiahe port facility in Baiyang Town (白洋镇), below Yichang. The 95-kilometre (59 mi) long southern portage railway (南岸翻坝铁路) will run from Maoping (upstream of the dam) via Yichang South Railway Station to Zhicheng (on the Jiaozuo–Liuzhou Railway). In late 2012, preliminary work started along both future railway routes. Allegedly, funds for relocating 13,000 farmers around Gaoyang disappeared after being sent to the local government, leaving residents without compensation. The 600 km (370 mi) long reservoir flooded some 1,300 archaeological sites and altered the appearance of the Three Gorges as the water level rose over 91 m (300 ft). Cultural and historical relics are being moved to higher ground as they are discovered, but the flooding inevitably covered undiscovered relics. Some sites could not be moved because of their location, size, or design. For example, the hanging coffins site high in the Shen Nong Gorge is part of the cliffs. The United States Department of Defense reported that in Taiwan, "proponents of strikes against the mainland apparently hope that merely presenting credible threats to China's urban population or high-value targets, such as the Three Gorges Dam, will deter Chinese military coercion." The notion that the military in Taiwan would seek to destroy the dam provoked an angry response from the mainland Chinese media. People's Liberation Army General Liu Yuan was quoted in the China Youth Daily saying that the People's Republic of China would be "seriously on guard against threats from Taiwan independence terrorists." The Three Gorges Dam is a steel-concrete gravity dam. The water is held back by the innate mass of the individual dam sections. As a result, damage to an individual section should not affect other parts of the dam. However, damage to the entire dam through means such as missiles could cause flooding along a large area of the Yangtze River due to overflow spillage. Days after the first filling of the reservoir, around 80 hairline cracks were observed in the dam's structure. The submerged spillway gates of the dam might pose a risk of cavitation, similar to that which severely damaged the poorly designed and cavitating spillways of the Glen Canyon Dam in the US state of Arizona, which was unable to properly withstand the Colorado river floods of 1983. However, 163,000 concrete units of the Three Gorges dam all passed quality testing and the deformation was within design limits. An experts group gave the project overall a good quality rating. In order to maximize the utility of the Three Gorges Dam and cut down on sedimentation from the Jinsha River, the upper course of the Yangtze River, authorities plan to build a series of dams on the Jinsha, including Wudongde Dam, Baihetan Dam, along with the now completed Xiluodu and Xiangjiaba dams. The total capacity of those four dams is 38,500 MW, almost double the capacity of the Three Gorges. Baihetan is preparing for construction and Wudongde is seeking government approval. Another eight dams are in the midstream of the Jinsha and eight more upstream of it. ^ Ma, Yue (November 26, 2010). "Three Gorges Dam". Stanford University. Retrieved February 13, 2016. ^ a b "Three Gorges Project" (PDF). Chinese National Committee on Large Dams. Retrieved January 1, 2015. ^ Engineering Geology for Society and Territory - Volume 2: Landslide Processes. Springer. 2014. p. 1415. ISBN 3319090577. ^ Cutler J. Cleveland; Christopher G. Morris (November 15, 2013). Handbook of Energy: Chronologies, Top Ten Lists, and Word Clouds. Elsevier Science. p. 44. ISBN 978-0-12-417019-3. ^ Robert Ehrlich (March 13, 2013). Renewable Energy: A First Course. CRC Press. p. 219. ISBN 978-1-4665-9944-4. ^ a b 三峡工程最后一台机组结束72小时试运行. ctg.com.cn. Archived from the original on May 12, 2013. Retrieved June 23, 2012. ^ "Three Gorges underground power station electrical and mechanical equipment is fully handed over production" (in Chinese). China Three Gorges Corporation. Archived from the original on April 5, 2013. Retrieved July 8, 2012. ^ a b c d "The world's largest 'L boat lift' Three Gorges Dam successfully tested" (in Chinese). Chutianjinbao News. January 14, 2016. Retrieved February 15, 2016. ^ a b c Acker, Fabian (March 2, 2009). "Taming the Yangtze". IET magazine. Archived from the original on July 16, 2018. ^ a b 三峡工程左右岸电站26台机组全部投入商业运行 (in Chinese). China Three Gorges Project Corporation. October 30, 2008. Archived from the original on February 9, 2009. Retrieved December 6, 2008. ^ "Three Gorges reservoir raises water to target level". Xinhua. October 7, 2008. Archived from the original on January 10, 2010. Retrieved November 23, 2010. ^ a b c "Final Turbine at China's Three Gorges Dam Begins Testing". Inventor Spot. Retrieved May 15, 2011. ^ 中国长江三峡工程开发总公司. Ctgpc.com.cn. April 8, 2009. Archived from the original on October 2, 2011. Retrieved August 1, 2009. ^ 中国长江三峡工程开发总公司. Ctgpc.com.cn. March 10, 2009. Archived from the original on October 2, 2011. Retrieved August 1, 2009. ^ 一座自主创新历史丰碑 三峡工程的改革开放之路. Hb.xinhuanet.com. Archived from the original on February 28, 2009. Retrieved August 1, 2009. ^ 重庆云阳长江右岸现360万方滑坡险情-地方-人民网. People's Daily. Retrieved August 1, 2009. See also: 探访三峡库区云阳故陵滑坡险情. News.xinhuanet.com. Retrieved August 1, 2009. ^ Lin Yang (October 12, 2007). "China's Three Gorges Dam Under Fire". Time. Retrieved March 28, 2009. The giant Three Gorges Dam across China's Yangtze River has been mired in controversy ever since it was first proposed See also: Laris, Michael (August 17, 1998). "Untamed Waterways Kill Thousands Yearly". The Washington Post. Retrieved March 28, 2009. Officials now use the deadly history of the Yangtze, China's longest river, to justify the country's riskiest and most controversial infrastructure project – the enormous Three Gorges Dam. and Grant, Stan (June 18, 2005). "Global Challenges: Ecological and Technological Advances Around the World". CNN. Retrieved March 28, 2009. China's engineering marvel is unleashing a torrent of criticism. [...] When it comes to global challenges, few are greater or more controversial than the construction of the massive Three Gorges Dam in Central China. and Gerin, Roseanne (December 11, 2008). "Rolling on a River". Beijing Review. Retrieved March 28, 2009. ...the 180-billion yuan ($26.3 billion) Three Gorges Dam project has been highly contentious. ^ Lin Yang (October 12, 2007). "China's Three Gorges Dam Under Fire". Time. ^ a b 中国国民党、亲民党、111新党访问团相继参观三峡工程_新闻中心_新浪网. News.sina.com.cn. Retrieved August 1, 2009. ^ a b Steven Mufson (November 9, 1997). "The Yangtze Dam: Feat or Folly?". Washington Post. Retrieved November 23, 2010. ^ 1992年4月3日全国人大批准兴建三峡工程. News.rednet.cn. Archived from the original on September 27, 2011. Retrieved August 16, 2009. ^ Allin, Samuel Robert Fishleigh (November 30, 2004). "An Examination of China's Three Gorges Dam Project Based on the Framework Presented in the Report of The World Commission on Dams" (PDF). Virginia Polytechnic Institute and State University. Archived from the original (PDF) on July 4, 2010. Retrieved November 23, 2010. ^ a b "Water level at Three Gorges Project raised to full capacity". xinhuanet.com. Archived from the original on October 29, 2010. ^ 三峡完成172.5米蓄水 中游航道正常维护(图)-搜狐新闻. News.sohu.com. Retrieved August 16, 2009. ^ "Three Gorges Dam Project – Quick Facts". ibiblio.org. Retrieved November 23, 2010. ^ "三峡水库：世界淹没面积最大的水库 (Three Gorges reservoir: World submergence area biggest reservoir)". Xinhua Net. November 21, 2003. Archived from the original on October 12, 2007. Retrieved April 10, 2008. ^ a b "International Water Power and Dam Construction". Waterpowermagazine.com. January 10, 2007. Archived from the original on June 14, 2011. Retrieved August 1, 2009. ^ "国家重大技术装备". Chinaneast.xinhuanet.com. January 11, 2009. Archived from the original on February 8, 2009. Retrieved August 1, 2009. ^ "官方:三峡工程回收投资成本" (in Chinese). 中新社. December 20, 2013. Retrieved May 21, 2016. ^ "Three Gorges Dam" (in Chinese). China Three Gorges Project Corporation. April 20, 2003. Archived from the original on April 7, 2007. Retrieved April 29, 2007. ^ 三峡机组国产化已取得成功 (in Chinese). hb.xinhuanet.com. December 4, 2008. Archived from the original on December 7, 2008. Retrieved December 6, 2008. ^ 李永安:我水轮发电机组已具完全自主设计制造能力_财经频道_新华网 (in Chinese). Xinhua News Agency. August 28, 2008. Archived from the original on December 7, 2008. Retrieved December 6, 2008. ^ Morioka, Matthew; Abrishamkar, Alireza; Kay CEE 491, Yve. "THREE GORGES DAM" (PDF). Retrieved February 2, 2017. ^ "Three Gorges Dam" (in Chinese). Government of China. October 18, 2006. Retrieved May 15, 2007. ^ 三峡右岸电站19号机组完成72小时试运行 (in Chinese). China Three Gorges Project Corporation. June 20, 2008. Archived from the original on December 7, 2008. Retrieved December 6, 2008. ^ "中国长江三峡工程开发总公司". Ctgpc.com.cn. July 4, 2008. Archived from the original on February 10, 2009. Retrieved August 1, 2009. ^ 三峡23号机组进入72小时试运行 (in Chinese). China Three Gorges Project Corporation. August 22, 2008. Archived from the original on February 25, 2012. Retrieved December 6, 2008. ^ "三峡地下电站30号机组充水启动 (Three Gorges Underground Power Station Unit No. 30, water-filled start)". Three Gorges Corporation. Archived from the original on March 22, 2012. Retrieved July 4, 2011. ^ "Three Gorges underground power station water-filled start the third unit successfully put into operation in July plans" (in Chinese). Fenghuang Wang. Retrieved July 10, 2011. ^ "The last two units of the Three Gorges" (in Chinese). Xinhua. February 11, 2012. Retrieved February 15, 2012. ^ "三峡电站持续安稳运行累计发电突破5000亿千瓦时". ctgpc.com.cn. Archived from the original on October 2, 2011. Retrieved August 28, 2011. ^ 三峡工程左右岸电站26台机组全部投入商业运行 – 中国报道 – 国际在线 (in Chinese). CRI online. October 30, 2008. Retrieved December 6, 2008. ^ 三峡电站月发电量首过百亿千瓦时 (in Chinese). China Three Gorges Project Corporation. August 15, 2008. Archived from the original on December 7, 2008. Retrieved December 6, 2008. ^ "三峡电站26台发电机组投产后首次满负荷发电". Hb.xinhuanet.com. Archived from the original on July 5, 2009. Retrieved August 1, 2009. ^ a b "中国长江三峡工程开发总公司". Ctgpc.com.cn. Archived from the original on September 8, 2011. Retrieved August 16, 2009. ^ "国家电网公司-主要水电厂来水和运行情况". Sgcc.com.cn. Archived from the original on January 30, 2009. Retrieved August 1, 2009. ^ "China's Three Gorges sets new production record". Hydro World. January 10, 2013. Retrieved January 10, 2013. ^ "国家重大技术装备". Chinaequip.gov.cn. January 8, 2010. Archived from the original on April 29, 2010. Retrieved August 20, 2010. ^ "峡 – 葛洲坝梯级电站全年发电1006.1亿千瓦时". Archived from the original on September 1, 2011. 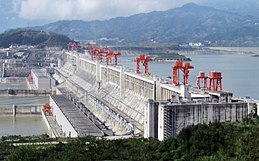 ^ "Three Gorges Project Generates 78.29 Bln Kwh of Electricity in 2011". ^ "China's Three Gorges dam 'breaks world hydropower record'". ^ "Itaipu bate Três Gargantas e reassume liderança em produção – Itaipu Binacional". itaipu.gov.br. Retrieved January 7, 2016. ^ "Three Gorges Project reaches 1 trillion kWh milestone". China Daily. March 1, 2017. Retrieved May 20, 2017. ^ "China's Three Gorges project increases power output in 2017". GBTimes.com. January 4, 2017. Retrieved March 2, 2018. ^ Zhang, Jie (December 21, 2018). "Three Gorges Dam generates record amount of power - Chinadaily.com.cn". www.chinadaily.com.cn. Retrieved March 21, 2019. ^ "Construction of the Three Gorges Project and Ecological Protection". Chinagate.com.cn. November 27, 2007. Retrieved March 24, 2014. ^ "Three Gorges Dam" (in Chinese). National Development and Reform Commission. December 20, 2007. Retrieved December 20, 2007. ^ "Three Gorges, China". ABB Group. Archived from the original on October 13, 2007. Retrieved November 23, 2010. ^ "Three Gorges Dam" (in Chinese). Chinese Society for Electrical Engineering. May 25, 2006. Archived from the original on April 29, 2007. Retrieved May 16, 2007. ^ "Three Gorges Dam" (in Chinese). NDRC. March 7, 2007. Archived from the original on March 10, 2007. Retrieved May 15, 2007. ^ "Greenhouse Gas Emissions By Country". Carbonplanet. 2006. Archived from the original on April 9, 2010. Retrieved November 23, 2010. ^ "Three Gorges Dam" (in Chinese). TGP. June 12, 2006. Archived from the original on March 29, 2010. Retrieved May 15, 2007. ^ Topping, Audrey Ronning. Environmental controversy over the Three Gorges Dam. Earth Times News Service. ^ a b c d Qing, Dai, 9. The River Dragon Has Come! : The Three Gorges Dam and the Fate of China's Yangtze River and Its People (East Gate Book). Armonk, New York: M.E. Sharpe, 1997. ^ "三峡大坝之忧". The Wall Street Journal. August 28, 2007. Retrieved August 16, 2009. ^ Winchester, Simon (1998). The River at the Center of the World. New York: Henry Holt & Co. p. 228. ISBN 978-0-8050-5508-5. ^ Segers, Henrik; Martens, Koen (2005). The River at the Center of the World. Springer. p. 73. ISBN 978-1-4020-3745-0. ^ Yang, Sung. "No Casualties in Three Gorges Dam Landslide". Xinhua News Network. CRIEnglish.com. Retrieved June 3, 2009. ^ a b Richard Jones, Michael Sheridan (May 30, 2010). "Chinese dam causes quakes and landslides". The Times. London. Retrieved January 25, 2011. ^ Peter Collins, Falling Here, Rising There, The World in 2008, The Economist, p. 63. ^ a b Wu, Jianguo, et al. "Three-Gorges Dam – Experiment in Habitat Fragmentation?" Science 300-5623 (May 23, 2003): 1239–1240. ^ Chetham, Deirdre. "Before the Deluge: The Vanishing World of the Yangtze's Three Gorges." New York: Palgrave Macmillan, 2002. ^ Chetham, Deirdre. "Before the Deluge: The Vanishing World of the Yangtze's Three Gorges." ^ Xie, Ping. "Three-Gorges Dam: Risk to Ancient Fish." Science 302-5648 (November 14, 2003): 1149. ^ Mary Ann Toy, The Age AU, "Three Gorges Dam 'could be huge disaster'", 10-13-07, retrieved 10-13-07. ^ "Three Gorges Dam Case Study". American University, The School of International Service. Retrieved January 20, 2008. ^ Theuerkauf, Ethan (October 2, 2007). "Three Gorges Dam: A Blessing or an Environmental Disaster?". The Flat Hat. Archived from the original on February 22, 2008. Retrieved June 21, 2015. ^ "三峡工程的防洪作用将提前两年实现-经济-人民网". People's Daily. Retrieved August 1, 2009. ^ "三峡工程防洪、通航、发电三大效益提前全面发挥". Chn-consulate-sapporo.or.jp. May 16, 2006. Archived from the original on December 25, 2007. Retrieved August 1, 2009. ^ "39.1931, 1935, 1954, 1998 年长江流域发生的4次大洪水造成了怎样的洪水灾害??". People's Daily. Retrieved August 1, 2009. ^ "Three Gorges Dam" (in Chinese). CTGPC. April 20, 2002. Archived from the original on April 7, 2007. Retrieved June 3, 2007. ^ "经过不懈努力三峡枢纽主体工程建设任务提前完成". Gov.cn. Retrieved August 1, 2009. ^ "三峡水库可如期消落至145米汛限水位". Hb.xinhuanet.com. Archived from the original on February 28, 2009. Retrieved August 1, 2009. ^ "中国长江三峡工程开发总公司". Ctgpc.com.cn. August 7, 2009. Archived from the original on July 28, 2011. Retrieved August 16, 2009. 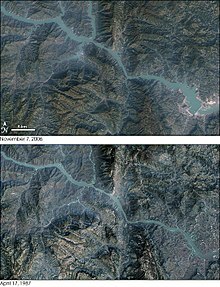 ^ Three Gorges Dam will meet the first large-scale flood since being completed Archived July 23, 2010, at the Wayback Machine July 20, 2010. Retrieved July 20, 2010. ^ 三峡迎来7万立方米/秒特大洪峰 规模超1998年 (in Chinese). SINA Corporation. ^ "NASA Details Earthquake Effects on the Earth". NASA/JPL. Retrieved November 10, 2017. ^ Joseph J. Hobbs; Andrew Dolan (2008). World Regional Geography. Cengage Learning. p. 376. ISBN 978-0-495-38950-7. ^ "The Three Gorges Dam". Washington Post. 1997. Archived from the original on December 14, 2011. Retrieved December 14, 2011. A maximum depth of 574 feet. This is expected to allow 10,000-ton ocean-going cargo ships and passenger liners to navigate 1,500 miles inland to Chongqing. ^ "Yangtze as a vital logistics aid" (in Chinese). China Economic Review. May 30, 2007. Archived from the original on August 7, 2010. Retrieved June 3, 2007. ^ "Three Gorges Dam". Missouri Chapter American Fisheries Society. April 20, 2002. Archived from the original on August 9, 2008. Retrieved November 23, 2010. ^ "Its Buildings with Biggest Indices". China Three Gorges Project. 2002. Archived from the original on August 9, 2008. Retrieved November 23, 2010. ^ MacKie, Nick (May 4, 2005). "China's west seeks to impress investors". BBC. Archived from the original on August 9, 2008. Retrieved November 23, 2010. ^ "Its Buildings with Biggest Indices". China Three Gorges Project. 2002. Archived from the original on October 23, 2013. Retrieved November 23, 2010. ^ MacKie, Nick (May 4, 2005). "China's west seeks to impress investors". BBC. Retrieved November 23, 2010. ^ a b "Three Gorges Dam Ship Lift, People's Republic of China". 2013. Archived from the original on April 21, 2016. Retrieved April 19, 2016. ^ "Three Gorges dam ready to go". The Taipei Times. May 21, 2006. Archived from the original on August 9, 2008. Retrieved November 23, 2010. ^ "China Completes Three Gorges Dam". CBS News. May 20, 2006. Archived from the original on August 9, 2008. Retrieved November 23, 2010. ^ "Tower columns for Three Gorges shiplift to be built". Yichang, Hubei Province: Xinhua. February 27, 2012. Archived from the original on February 27, 2013. The entire shiplift will be completed in 2015. ^ "Three Gorges Dam exceeds cargo target set for 2030". South China Morning Post. May 23, 2014. Retrieved October 12, 2015. ^ Wang Yichen (February 17, 2016). "China shifts from follower to leader in hydropower development". China Economic Net. Archived from the original on February 18, 2016. Retrieved December 12, 2018. CTGC announced on January 6 that the Three Gorges ship lift with the maximum lifting height reaching 113 meters and allowing ships with displacement of 3000-ton passing the dam has conducted real vessel experiment successfully in late December last year. ^ Jan Akkermann; Thomas Runte; Dorothea Krebs (2009). "Ship lift at Three Gorges Dam, China − design of steel structures" (PDF). Steel construction 2. Retrieved April 19, 2016. The ship chamber is designed for passenger ships with a max. water displacement of 3000 tonnes, max. length of 84.5 m, max. width of 17.2 m and max. draught of 2.65 m.
^ "Phase I Field Trial of Ship Lift at Three Gorges Dam Successfully Ends". China Three Gorges Project. August 14, 2016. Archived from the original on August 14, 2016. Retrieved August 14, 2016. ^ "World's largest shiplift starts operation at China's Three Gorges Dam". Shanghai Daily. September 18, 2016. Archived from the original on September 18, 2016. A permanent shiplift on the Three Gorges Dam in central China's Hubei Province began trial operation on Sunday. ^ 三峡四期移民工程通过阶段性验收 (in Chinese). China Three Gorges Project Corporation. August 22, 2008. Archived from the original on December 7, 2008. Retrieved December 6, 2008. ^ a b "中港台 #93; 三峡库区城镇完成拆迁-华尔街日报". The Wall Street Journal. Retrieved August 1, 2009. ^ Three Gorges Dam. International Rivers. Retrieved May 5, 2015. ^ "China dam to displace millions more". MWC News. October 13, 2007. Archived from the original on October 14, 2007. Retrieved November 23, 2010. ^ Liang Chao (July 15, 2004). "More bid farewell to Three Gorges". China Daily. Retrieved January 20, 2008. ^ "Millions forced out by China dam". BBC News. October 12, 2007. Retrieved January 20, 2008. ^ Wang Hongjiang (October 11, 2007). "Millions more face relocation from Three Gorges Reservoir Area". Xinhua. Retrieved January 20, 2008. ^ Jiang Yuxia (September 26, 2007). "China warns of environmental "catastrophe" from Three Gorges Dam". Xinhua. Retrieved November 23, 2010. ^ Guo Jinjia; Yang Shanyin (November 16, 2007). "重庆澄清"三峡库区二次移民四百万"传闻". People's Daily. Archived from the original on November 19, 2007. Retrieved April 10, 2011. ^ Julie Chao (May 15, 2001). "Relocation for Giant Dam Inflames Chinese Peasants". National Geographic. Retrieved January 20, 2008. ^ Regine Debatty (December 9, 2007). "Flotsam, Jetsam and the Three Gorges Dam". World Changing. Archived from the original on July 6, 2008. Retrieved January 20, 2008. ^ C.Michael Hogan. Andy Burnham (ed.). "Shen Nong Gorge Hanging Coffins". The Megalithic Portal. Retrieved January 20, 2008. ^ "Annual report on the military power of the People's Republic of China (.pdf)" (PDF). US Department of Defense. Retrieved January 28, 2007. ^ "Troops sent to protect China dam". BBC. September 14, 2004. Retrieved November 23, 2010. ^ "Just Two Missiles could blow up China's Three Gorges Dam and kill millions". Defence News. January 18, 2018. Retrieved March 30, 2019. ^ "Three Gorges Dam". International Rivers. Retrieved June 3, 2009. ^ Adams, Jerry. "Three Gorges Dam". Electronic Data Interchange. Awesome Library. Retrieved June 3, 2009. ^ "Three Gorges Dam". Living On Earth. Retrieved June 3, 2009. ^ "三峡工程质量处于良好受控状态". Aqsiq.gov.cn. Retrieved August 16, 2009. ^ "中国三峡总公司拟在金沙江上建４座梯级水电站 总装机容量为３８５０万千瓦_中国电力网新闻中心". chinapower.com.cn. Archived from the original on February 8, 2009. Retrieved August 1, 2009. ^ "Beijing Environment, Science and Technology Update". U.S. Embassy in China. March 7, 2003. Archived from the original on October 11, 2007. Retrieved January 20, 2008. ^ "Beyond Three Gorges in China". Water Power Magazine. January 10, 2007. Archived from the original on June 14, 2011. Retrieved November 23, 2010. 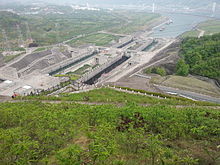 Wikimedia Commons has media related to Three Gorges Dam.